Puppy training school aims to help your puppy become a well-trained adult dog, in addition to providing you with the required details to raise them the right way. The crucial learning period of a pup is typically between 4 – 17 weeks. This is the best time to enrol them for puppy training classes where they’ll learn all the essential rules and behaviours. Puppy training services provide you with the tools and information to start training your pup. It is also a great way to recognize any difference between normal behaviours for your dog and adapt accordingly to help them overcome these difficulties. Provide you general health care information for your pup. Offer exercise and diet-related advice. Devise strategies to help them adapt to environmental changes. Provide basic training that includes teaching easy commands such as sit, stand, drop, wait, and recall. Help you be a good leader. Educate you to read and understand their body language. Provide lessons for crate training your puppy including helpful tips. Tutor you about their grooming tips. Assistance with how puppies and children should interact. Address other problems such as barking, mouthing, and jumping up on strangers. 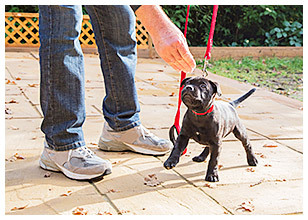 Show your pup how to behave with unfamiliar people and dogs in a non-threatening and rewarding way. Effectively expose them to other breeds. Teach them to read and understand other dogs’ body language. Help them to differentiate between essential instructions and play. A puppy preschool will help your pet engage with other dogs. They will be paired with other pups of a similar confidence level to ensure both have a positive and productive experience. This will help them gradually become a confident dog. While searching for dog training classes, it is crucial that you select ones that use positive training methods. 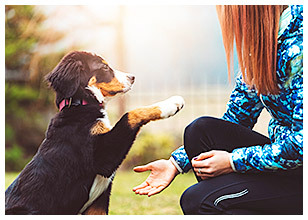 This teaches your pup to perform the desired action in return for a treat which could be anything that encourages them such as praise, food, and toys. They also use negative reinforcement to teach your pup the desired behaviour by not acknowledging their improper conduct such as jumping and barking unnecessarily. It is based on a positive experience rather than unpleasant or negative ones. It can help improve the relationship with your dog. It is a gentle and kind approach to help them learn things. It does not use aversive or uncompassionate forms of teaching when training your dog and does not physically harm them. Since it is based on scientifically proven methods, it really works to help your pup. At Alpha Paws, we have experienced and qualified trainers to help your pup become a confident adult dog. We use effective techniques to teach them the desired behaviour. For more information about our dog training program, reach out to our experts by calling 1-877-868-5248 (PAWS).